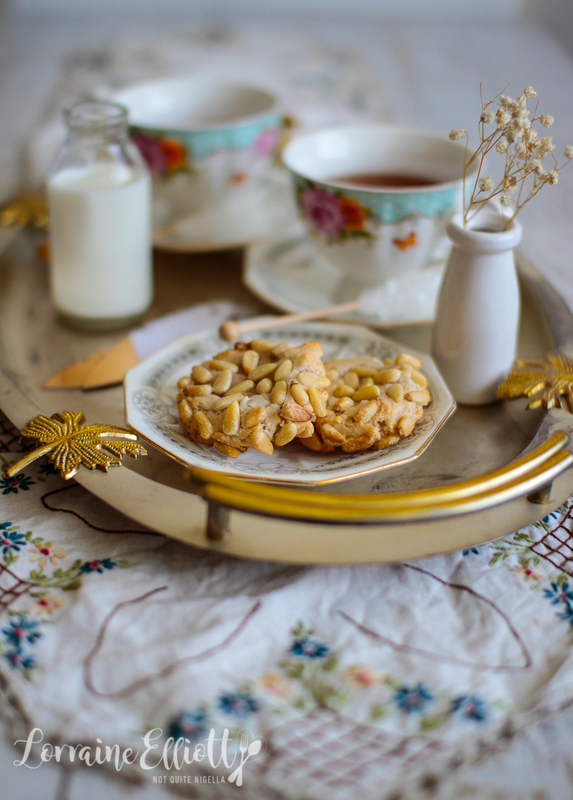 These delicate and fudgey textured Pignoli (meaning pine nut) cookies are such a treat. Made with just four ingredients (plus spices and flavours that I improvised) these are a bit crunchy on the outside from the pine nuts and blissfully chewy and soft on the inside. The sort of cookies that Santa would love! Pignolo is the singular and pignoli is the plural of these cookies. They can be either crescent shaped or round and are found in Sicilian and Catalonian communities. You may have seen the almond version called Amaretto. 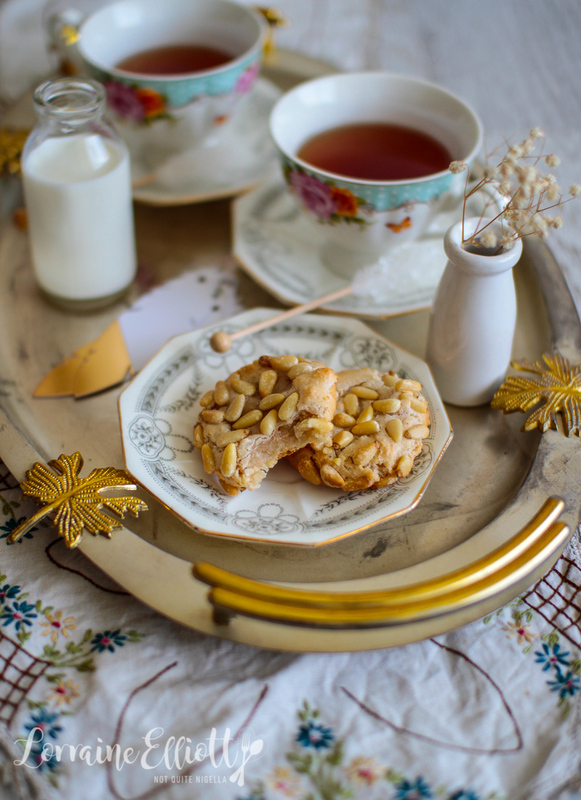 As the ingredients for this cookie are expensive (pine nuts, almond meal) these tend to be served on special occasions like Christmas. 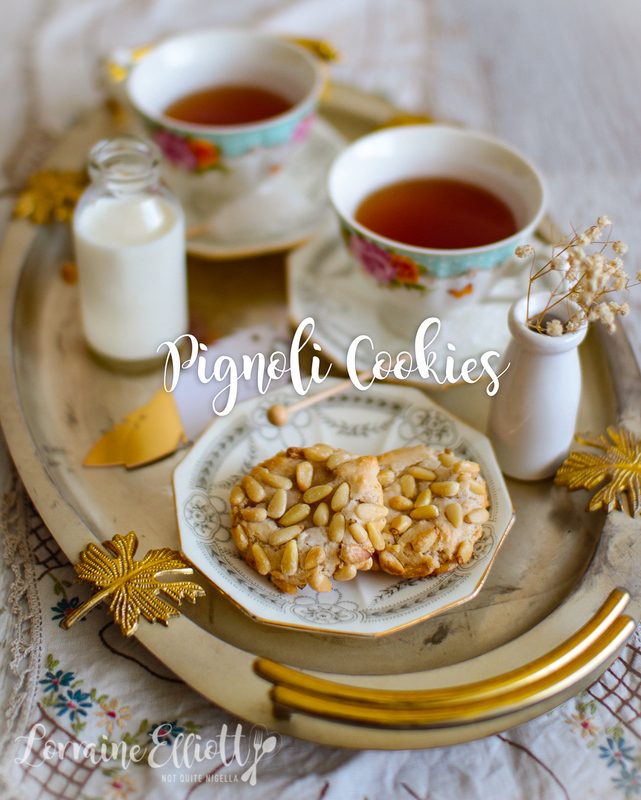 As soon as I saw the pignoli on Marcellina's lovely blog I earmarked them immediately. They were just the right side of simple. I made a half batch and soon I wish I had made a whole batch. I first met Marcella and her equally lovely sister Trish a few years ago when I did a tour around Queensland and they were the warmest, most welcoming people. As Marcella mentioned they were very easy which is just what you need before Christmas especially if you're hosting everyone for Christmas dinner. Speaking of Santa, this year we decided to take Mochi for a Santa photo as I was inspired to do so by a friend of mine with her doggy Santa photos. We found a place that allows dogs and arrived there early one Saturday morning. The queue was already long established even though we were there half an hour before the official start time. Every second group of people had a dog and they were very well behaved for the most part. Mr NQN held our spot in the queue while I sat down with Mochi in my lap. When he got close to the front of the queue I popped on Mochi's elf outfit and we placed her on Santa's lap. There they were: Santa and his little fluffy white elf helper. You couldn't see where Mochi's white fur ended and Santa's beard began. Santa was so taken with her he asked if he could use the photo for his portfolio! As for me, I was remiss and should have also handed the poor guy a cookie as he was in for a loooong afternoon! So tell me Dear Reader, did you take a Santa photo this year? Are you hosting Christmas lunch or dinner at your place this year? P.S. rather randomly, and not really related, but if you want to learn how to make custom printed chocolate bark, take a peek at this video! 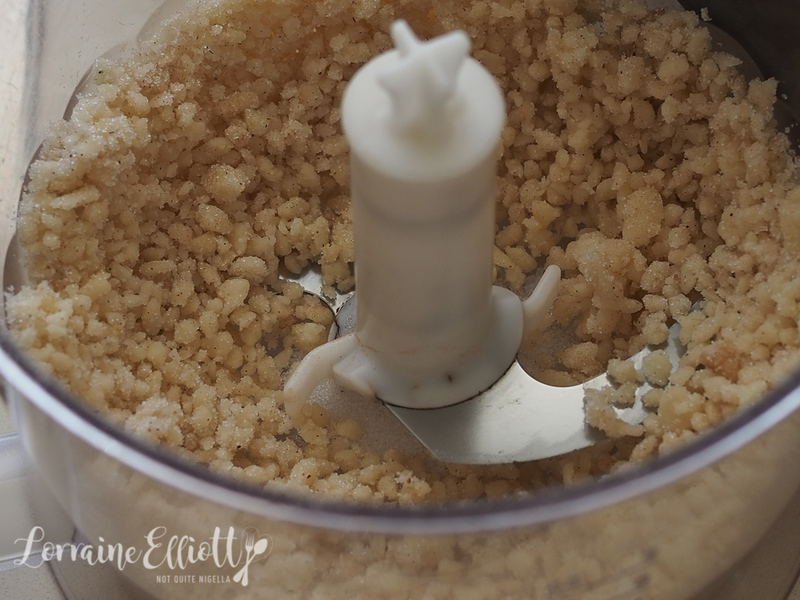 Step 1 - Break the marzipan up into small pieces and place in a food processor along with the sugar, egg whites, vanilla, cinnamon, nutmeg and orange zest. Process until you get a smooth paste. Place in a covered bowl in the fridge for 1 hour. Step 2 - Preheat oven to 180C/350F and line 2 trays with parchment. Lay out the pine nuts on a rimmed plate. 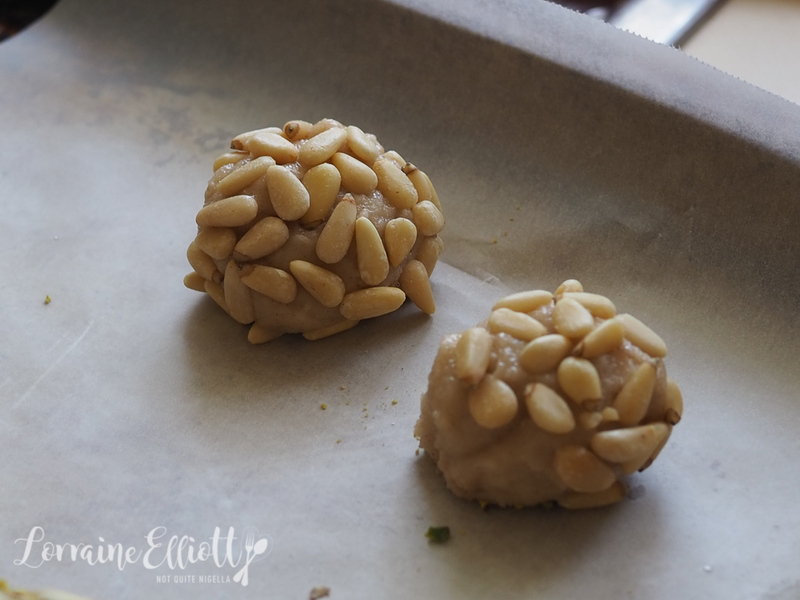 Scoop out small balls and roll in the pine nuts. Place on the lined trays. Bake for 18-20 minutes.